From Roman to modern, Nîmes is a small city with lots to see. Nîmes is a small city with a long history. Its major sites are impressive and easy to visit. Nîmes was an important center in Gallo-Roman times, reaching its peak in the second century AD. Today major monuments attest to its importance: The Maison Carrée, right in the center of town; and the Amphitheater, one of the largest and best preserved are the highlights. Nîmes is home to several museums. Just across from the Maison Carrée is the Musée d'Art Contemporain, also called Carré d'Art as its structure echoes the ancient one. Other museums include a fine arts museum, an archaeological museum, a natural history museum, an "Old Nîmes" museum, and even a bullfighting history museum! Entrance to the permanent collections is free for all museums, with fees charged for temporary exhibitions. Nîmes is the closest town to the impressive Pont du Gard, a spectacular Roman aquaduct built in the first century AD. Just 30 kilometers (about 19 miles) northeast of Nîmes, this aquaduct was built in the mid 1st century AD. 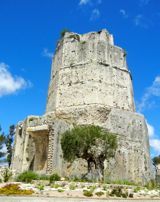 It was part of a 50 kilometer/31 mile long aquaduct that supplied Nîmes with water. Three levels high and 360 meters/1180 feet long, it is both a technical masterpiece and a work of art. In addition to the Pont itself, there are a variety of museums, cultural centers, films, and other media. Admission to the site is charged by the car, making it somewhat expensive for one or two people, but very reasonable for a family. 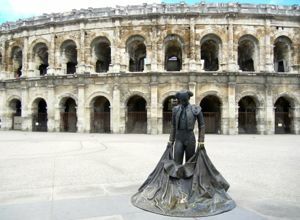 Above, Bullfighter statue in front of the Amphitheater, Nîmes. 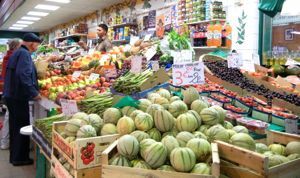 Below, Colorful market in Nîmes.